Before Sally Ride, Christa McAuliffe and Eileen Collins, courageous women were setting new records and conquering new horizons. Though largely unrecognized in history, the Mercury 13 women showed their determination, strength and bravery in the Space Race with accomplishments that paved the way for generations. The University of Wisconsin Oshkosh is proud to recognize the pioneering spirit of these women with honorary Doctor of Science—honoris causa—degrees. In the early days of the Space Race, 25 women were asked to train in secret as astronauts. The group was comprised of professional pilots, including some of the top female aviators of the day. Of these, only 13 were selected. The Mercury 13, as they came to be called, underwent the same rigorous physical and psychological testing as John Glenn, Alan Shepard and other men whose names have become legendary. Some of the women even outperformed their male counterparts. In summer of 1961, just before leaving for the next phase of training at the Naval Aviation Center in Pensacola, Fla., the women received telegrams telling them not to come. Due to the prejudices of the times, the project was cancelled. They never were allowed to fly in space. 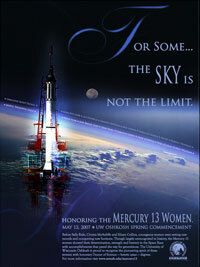 In honor of their pioneering spirit and efforts in the advancement of women’s rights, the University of Wisconsin Oshkosh will award with honorary doctorates to the Mercury 13 women at its commencement ceremonies on May 12, 2007. Watch the Panel Discussion Podcast that took place at UW Oshkosh 5/11/2007. See the Photos taken during the Panel Discussion.